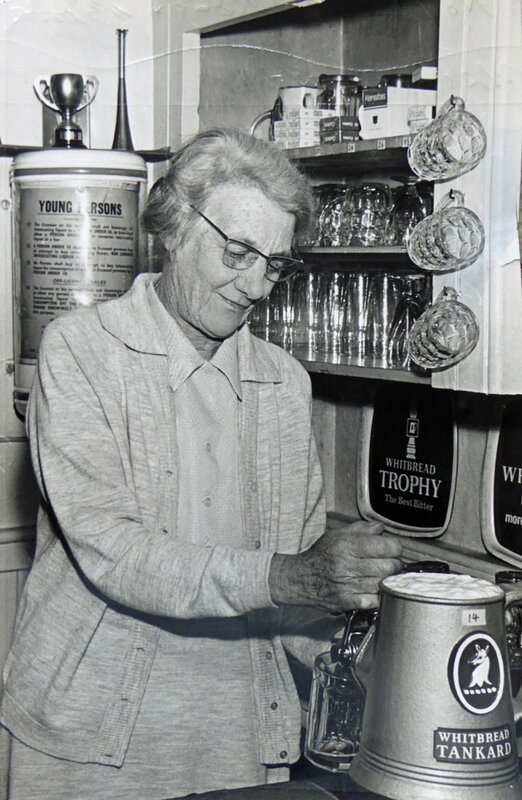 This photograph shows Lilian Mabel Stevens (née Perkins) and she is thought to be drawing the last pint of Whitbread beer in the New Inn at 29/30 Pilton Street before it closed in 1969. Margaret Reed’s book, ‘The Public Houses of Pilton’ (which is on The Pilton Story archive), simply lists the landlords and landladies of the New Inn since 1896. Below we add the fascinating story of the families who ran it for more than half a century. In the 60 years since Frederick James Perkins, from Mary Tavy, had taken over as landlord in 1909, the New Inn was run by two families - the Perkins and the Stevens – who inevitably became related because of the pub. When Frederick died in 1919 the family had to await the arrival of a man living in the pub before Frederick’s widow, Elizabeth Perkins (née Telling), from Purton near Swindon, was allowed to become landlady in 1920. That man was Herbert John Stevens who then married Lilian Mabel Perkins, one of the two daughters of Frederick and Elizabeth. Their other daughter was called Ada. In due course Herbert and Lilian had three children, Patricia Ruth, Eric John and Jill Elizabeth, and it is to Eric John ‘Steve’ Stevens we owe the details behind the names. When Elizabeth Perkins died in 1942, age 65, Herbert John Stevens took over as landlord. At some point, probably because he had died, is wife Lilian Mabel Stevens became the landlady, date unknown. She remained in that position until 1960 when she retired and the landlord became Arthur Douglas Lemon who had married the daughter of the house, Patricia Ruth Stevens, in 1945. The New Inn was de-licensed and converted to two houses in 1971.